Hello. I hit the jackpot last night on the yellow sticker dash. I arrived just as the young man was starting to mark them down for the last time. 75% off is a good saving, and there was lots to choose from and not many people after them. I've done a tot up, my YS haul came to £11.70, and the rest of the shopping was £13.72. My fridge is full again. Lots of salad, fruit, and veg, so healthy eating for a week or more. I volunteered to do a two hour stint as a marshal at a Medieval Festival, in the next village today. The job was to look official wearing a yellow vest, and to wander around in case anyone wanted to know anything. I did get one question, is there a tea and cake tent. Erm...no, teas and cakes are served in the Methodist Chapel down the road. This juggler was a great entertainer, he had the full attention of the kids who all sat round in a circle to watch. There was a wood turner and carver. A man who makes pottery. Birds of prey were on display. Beautiful birds. Old English music using old instruments. There was a lady demonstrating wet felting and needle felting. Her pictures were lovely. I see from her Facebook page that she has a workshop coming up in October to make a picture. I've sent her a message to ask if she has any places left. A group of Morris dancers were entertaining. The re enactment group were getting ready to do battle just as I left, although it looks like one of them is playing dead before they start. It was chilly so I didn't hang around to watch. My dinner tonight came straight out of the fridge. Mixed bean salad, houmous, potato salad, baby cucumber, tomato, and rocket leaves. There will be lots more like this over the next week. Can't decide whether to go for my walk tonight, it's been raining and it looks like there could be more. I'll make a decision in an hour. Last day of the month, tomorrow is check in day. I'll change the settings to allow Anon comments so the walking group who don't have an account can still check in. Thanks for popping in, enjoy your weekend. We'll catch up soon. Hello. It was a relief this morning to find I have no spam to check through. I could just zap the whole lot in one fell swoop, but occasionally there is a genuine comment in there, so rather than lose that one I scan through before I zap. It may take only a few seconds, but to keep on top of it I might check the spam folder several times a day, dumping as I go. If I didn't I would have 100+ to scan through, and that can get really annoying. Spam is generated automatically, a human sets it up initially, but from then on it appears at set times. The comments follow a pattern, same ones over and over again. Some are in another language, easy to spot, they will get zapped whether they are genuine or not. Some spam comes through from account holders, meaning their name is a link to their site, they want to place a free add on my blog, Their comments are often complimentary, but do not relate to the post they are replying to. Some have only one word. If someone cannot be bothered to string a few words together, they get zapped. I have disabled the anonymous option for the time being. I'm sorry if this upsets genuine readers who want to comment, but can't because they don't have an account. You could set up an account with Google, it's free. You could sign up for a blog with Blogger, and not make any entries, that would enable you to comment on any Blogger blog. I have put a button on the top of my sidebar to subscribe to this blog, but to be honest I'm not sure how that works. Do you allow anonymous comments? How much spam do you get? Do you use word verification? How are people subscribing to your blog? If I was a business I would accept it as part of the working day, but this is my hobby, I can only allocate so much time to it. Hello. I love colour in my meals as well as in my surroundings. Colour is cheerful and uplifting, as opposed to dark and dull, which is miserable and gloomy. My lunch yesterday was mushrooms cooked in a little oil. Added to this was herbs from the garden, and a simple cheap veggie burger, (6 for £1 at Tesco). I defrosted it for a few seconds in the microwave, then cut it into six pieces and added it to the mushrooms. Left it on the gas for a few minutes to ensure it was cooked through, then broke an egg into it. Mix it together so the egg is cooked. Serve on a slice of wholemeal toast, with lettuce and tomato. It was lovely. This morning I thought I would do something different for breakfast. I have two avocados which were £1.85 to begin with, but I got them on a yellow sticker for 74p. Avocados are very expensive here, I only buy them when reduced. I made my usual mix of seeds and nuts, (linseeds, sunflower seeds, chia seeds, walnuts, almonds, and cashews), in the mini chopper, and added those to the mashed avocados in a bowl. A splash of toasted sesame seed oil gave it a lovely flavour. Spread it on a slice of wholemeal toast and top with a boiled egg. I struggled to eat all that, I'm sure it's going to make me feel fuller for longer. I think it will be a late lunch today. My friend came round yesterday morning, she has exactly the same sewing machine as I rescued from the tip. Sadly I don't have a lead for it, but she has, so she brought it to see if the machine works. And yes it does, yipeeee. She also has the manual. I am now going to have a play with it, it hums like a dream. Then I will make enquiries to find a lead, starting with the sewing machine shop in town. I got caught out in the rain last night on my walk, it hammered it down so I cut it short to two miles. That Joe is a fit bod, isn't he. Nice to look at, but I would find it difficult to keep up with him. I'm glad he is doing a lot of work with children, they need a role model like him to get them moving. I'll stick with the fast paced walking, and a bit of dancing around the room to sixties music. Thanks for popping in, we'll catch up soon. Hello. Did you know it's National Fitness Day today? No, I didn't either. So, here we go, some ideas to get you started. There are four hours left, it finishes at midnight, but you can carry on indefinitely if you like. Still time to go out for a walk. 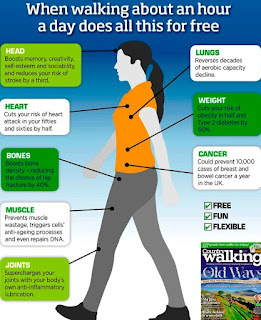 Good reasons why you should walk. Joe Wicks is the latest fitness guru, here he shows you how to warm up before a workout. And when you are nice and warm, here is Joe again with his 20 minute beginners workout. And here he is again with some ideas for healthy snacks. So there you are. No excuses, Joe is your man. I'm off for my walk. Thanks for popping in, we'll catch up soon. Hello. Here's a quick make if you have an hour or two to spare. I cut these felt flower shapes out yesterday at Crafty Club, and today I stitched them together. Simple blanket stitch with a button in the centre, and a fleece offcut in the middle to give them a bit of thickness. Can be hung anywhere, separately or on a string. Anyone else going to have a go at making these? I've been playing outside today, it's been warm and sunny. I have removed the waste pipe from the bottom of the washbasin, and have been looking for something to stand it on. I will get there eventually. Hello. Plenty to do today. Bailey poodle walk first thing. Then Crafty Club, it was very busy, full house, new members. This afternoon I went round the corner and had a coffee with my neighbours who have recently lost their elderly cat. They had a sort out and as they don't plan on getting another fur baby, they donated their cat paraphernalia to our cat rescue. There was wet and dry food, litter, carriers, litter box, scratching posts, and blankets and towels. I had to take my car round there to pick it up. Opposite their house is some building work going on at a big house which has recently been sold. I could see that things were being thrown in the skip on the front drive. Had to go and have a look. This is what I rescued. A sink which will make a quirky planter for my garden. I will have to make a wooden stand for it because the bottom is not flat. A wooden plate and cup stand which has been painted in the shabby chic style. It looks a bit of a mess and is a bit wonky, so with some repairs and a coat of paint I will upcycle it into something else. Three shelves, also shabby chic. These are really solid, very heavy wood, my friend thinks they are oak. It weighs a ton, he had to carry it from the car for me. There must be some fabulous pieces of wood underneath that scabby paint. It will stay in the garage awaiting my attention, until I get an idea for it. A piece of new carpet 4 ft x 4.5 ft. Good for the summer house. Colour not very obvious on the photo, it's green. Useful pieces of clean wood. Some flat pieces which are laminated on one side. You can't have too much useful wood. So, a very satisfying day, stuff rescued from landfill, and a donation for our rescue cats. People are kind. Just to remind you that it's the last day of the month on Saturday, the last few days for the Walking Group to up their miles. Sunday the 1st will be check in day, and I am getting very excited that such a lot of you are sticking with the challenge. I had a few days off last week after my long walk, but I am back on the three miles a day again. Do you really need to buy more food? Hello. I've had a very interesting and enjoyable afternoon. I visited two of the artists houses taking part in the Insight 2017 Open Studios. I was going to see a third but I ran out of time, so much to see and so much to talk about at the other two. The first was Helen who makes fabulous bags, and sends the profits to a dog charity in Thailand called Soi Dog. Beware the website has some distressing pictures. The second home was where Irene lives and works. She is an amazing lady. She works in many mediums, metal, fused glass, ceramics, raw wood, and any old rubbish she can get her hands on. She makes garden sculptures, wall hangings, jewelry, painting, and upcycling domestic and scrap metal. Her house is full of her work, and her ideas are so unique. Her small back garden is like a tropical rain forest, with a pond and plants growing everywhere. I loved looking around, we had such a lot to talk about. Sorry I didn't get any photographs, I felt it would be intrusive to take them inside her home. Unfortunately she doesn't have a web site. I made a little video this morning and set it to upload to yoootooob while I went out. Four hours later and it still hadn't finished uploading, but it's ready now. More people are signing up to my channel, not sure why because they are a bit amateurish, but as one young lady said, I am old and cute, so maybe that's why, ha ha. Hello. This weekend is the North Lincolnshire Artists Open Studios. Some of the artists work from home so they throw their doors open to anyone who wants to visit them. I go to the Ropewalk in Barton on Humber where there are several artists studios in the one building. I particularly like visiting Michael Scrimshaw, he is my kind of artist, making sculptures from piles of junk at his workshops at home. He looked a bit tired today as this is the second weekend of Open Studios and he has been talking to a lot of visitors. He soon perked up though as our conversations got underway. Both he and his wife are real arty types, and money savers, so we get on really well. They both have long hair down to their waist, Michaels being a mass of dreadlocks, which must be quite heavy. A lot of his work is commissioned, and is on show in public places. He tells me he is learning to play the violin, and after only one month of practicing, he can play quite a nifty Irish jig. I must admit I spent that long chatting to them I only had time for a quick in and out at the other studios. Moving swiftly on, I forgot to mention this the other day. I was in the town and went a bit further up the High Street than I usually do. There is a Herons Foods shop which I have never been in, so I thought I would check out the prices. It's not a very big shop, just two aisles. These items were 60p each or two for £1. So, 120g of beans for £1. On the Tesco web site a 850g bag of sliced beans is £1. Sliced mushrooms, 900g is £1. At Tesco a 500g bag is £1. So these are the better buys. You might want to check out your Heron Foods if you have one. I shall be walking that extra few hundred yards up the High street again in the future, to keep my eye on the bargains there. That's all for tonight folks. Thanks for popping in, have a nice Sunday, we'll catch up soon. Hello. I've had a lovely afternoon sewing whilst listening to Radio 3. It was very relaxing, I could get hooked on classical music. I've made these Suffolk Puff flowers. A simple idea, not mine, I found the instructions in this library book. Each one needs two circles of fabric, mine are 6 inches and 4 inches in diameter. Running stitch around the edge, and pull the thread tight so it gathers up into a puff ball. Sew the small one on top of the larger one, and add a button. I used pipe cleaners for the stalks, I bought these ages ago from Poundland, thought they might come in useful for something. I twirled the end round and stitched it onto the back of the flower. You could use wire or anything long and stick like. Or you could make them shorter, depending on the container you are going to put them in. Then I covered the back with a circle of felt to give a neat finish. The pipe cleaners are a bit floppy, a stiffer wire might be better. I have pinned these together at the back and stuck them in an old glass oil bottle. They could be worn as a corsage, with a brooch clasp fastened to the back. Or a ribbon attached and used to tie a parcel up. A small bouquet could be made and given as a gift. Mayze likes her new sunlounger. This is the old office chair I threw out, the back is broken and the seat cushion has been patched up and is falling apart. An old umbrella, rescued from a skip if I remember rightly, and clamped to the arm of the chair. She even lies there in the pouring rain. My dinner tonight was sweet potato, carrots, green beans, peas, and spinach, with half a packet of pasta in cheese sauce. It was very nice. Heidi is being a bit clingy tonight and I'm not going to get any more typing done, so I'll pop over to yooootooob and watch something. Thanks for popping in, have a good weekend, we'll catch up soon. Hello. I've been doing some quick calculations of what the latest holiday cost me. Yes, walking is free, put one foot in front of the other, so apart from the cost of sturdy boots there isn't any other equipment needed. You don't have to buy special walking clothes, as long as you dress according to the weather. It doesn't matter if you don't have designer labels. Six nights accommodation cost me £317. These ranged from a Youth Hostel at £33, and a hotel at £62. No expensive Radisson on this trip, ha ha. I budget £3.50 a day for picnic food that I can eat in my room, snacky things from small shops. Then there was the cost of the petrol to get to Bradford and on to Cleveleys, and back home again. And the train fair from Blackpool to Carlisle. Tot all this up and it comes to about £418. So not really a cheap holiday. When I first started doing these long walks I looked for the cheapest B & B I could find, because I didn't have much money. It was not easy to keep walking past a hotel, in the hope of finding a cheaper place further on. All I wanted to do at the end of a days trekking was sit down. However, things are not so financially dire now, I save enough money to be able to pay for a bed wherever I choose. I can stop more or less wherever I like now, within reason. People ask me if I camp. The answer is no, not on a long walk. I don't want to carry the gear, I want a real bed to sleep in, I want a real bathroom, and I want a good breakfast. Having to put a tent up after a long days walking does not appeal, and definitely not on a day when it's raining and windy. No thank you. Looking at my recent expenditure I seem to have got through a fair chunk of money in the last few weeks. Chair £100, specs £200, and camera £100. I have no regrets for these purchases, I have saved and there is money in my emergency fund to cover for them. All I have to do is to continue my frugal lifestyle and I will have money to spend on needs and a few wants. I've just had my credit card statement, £564, this includes petrol, food, vet, mobile phone top up, one hotel, specs and chair. This will be paid in full when I am next in town in a few days. So now the focus now will be on saving money to recover some of this spending, and top up my emergency fund. So what will I be doing in the next few weeks? For a start I will not be putting on the heating just yet, it isn't cold enough. I will not go mad spending on food, I will get a few fresh things, fruit and veg mainly, and eat what I have already got in the cupboard and freezer. I want to cut down on my dairy, mainly cheese, and experiment more with plant based food. Not going completely vegan, but I think there is a middle ground to be achieved. I need to drink more water, I don't drink enough. I will continue to rinse my pots and pans under a trickle of tap water as soon as I have finished with them, no mounds of washing up for me. I will assess the state of my clothes before I do a wash, making sure I have a full load each time, and only wash when it's a good line drying day. I will continue to scour the shops in town for the best prices on cat food. I will keep my food cupboard tidy so I know exactly what's in there. I will cook two or three portions of food at the same time so some of it can be heated in the microwave the following days. Now it is raining more often I will keep a large bucket in the downstairs toilet and use rainwater for flushing. The nights are getting longer so I will be more mindful about switching lights on. Switch them off when leaving a room. So, I will step up the money saving tactics I have learnt over the years, and hopefully not slip back into 'stuff it who cares', mode. We all need a treat now and again, but it's so easy to comfort spend and go a bit mad. Self control and self discipline is the order of the day. It is for me anyway. Are you re jigging your budget in readiness for the larger winter fuel bills? Don't be caught out, start your plan now. Thanks for popping in, we'll catch up soon. Hello. So it's back to normal, tidying garden, dog walking, and library today. There is housework to be done, but I will do that in dribs and drabs when I feel like it. The fridge is empty but I can manage a bit longer on what I have in before I go shopping. I am walking Bailey poodle again, Joyce is finding it a bit too much, she is a bit unsteady on her feet. The hedge next to the path through the Village Green is overgrown forcing people to walk over the grass. It's also difficult for those with mobility scooters, and now it's becoming quite muddy. Someone asked me if I knew anyone from the Council to report it to. It has been like this for a few weeks, the Council should have sent someone to cut it back by now. There's one way to solve the problem. I took my loppers, a pair of shears, and a brush to chop it all down and clear the path. If you want something doing, do it yourself, that's what I say. After lunch I went to see Stan on the mobile library, and changed my books. Look how well my herb planter is doing. It's about time I used some of it in my cooking. I have no idea how much to use, so I picked a handful. And chopped them up into small pieces. And added them to this. Quorn chunks, Quorn mince, frozen beans and peas, and a tin of chick peas. I added turmeric, vegetable granules, splash of orange juice, Danish Blue Cheese, and some porridge oats to thicken it. It's bloomin lovely, two more portions for the next two days. Oh dear, it's starting to get dark earlier now. I am layering up with extra clothes. Not looking forward to winter. Thanks for popping in, we'll catch up soon. Hello. Fully recovered now, Crafty Club this morning, feeling chipper. Yesterday Carol and I went to Fleetwood to go across the water on the ferry to Knott End. You may remember that I walked there last time I visited her, but didn't go on the ferry. This time we drove, and went across. On this map you can see the last part of my route, Pilling was where I decided to press on to the end. No point in going the shorter route for the ferry because the tide was out, and there was nowhere to get a bed for the night. So I walked past Hambleton and crossed over the River Wyre on the Shard Bridge. It was a nice day, sunny with a gentle breeze. The little boat behind the ferry is getting ready for a fishing trip. Time to get on, pay the man on board, £2 each way. Off we go, you can see the other side. Heading towards Knott End. There were some jet skiers about. Nearly there, it only takes five minutes. We had a stroll down the Promenade while we waited for the pub to open at 12 o clock. Carol had fish and chips, I had veggie lasagne and chips. It's a small quiet place people come for a couple of hours to look around, bikers meet at the cafe on the sea front. We headed back to the ferry and just missed one, didn't have to wait long for it to come back. The tide had gone out a bit and left the ramp muddy so the skipper got the hose out to clean it off before he let anyone get off. On our way back and we can see the lifeboat parked in it's berth. We went back to the car and decided to have a look at the Marina. You can't see it behind the shopping centre. Plenty of parking at the Freeport Outlet. It's one of those places where all the top names have stores, but because it's called a Freeport everyone assumes everything is going to be super cheap. We are not taken in by this and didn't step into any shops on our way through to the Marina. The place was busy as you can expect on a sunny Sunday afternoon. Not a very big Marina, only saw a few people pottering about, more like a boat parking lot. The houses you can see behind it are a large new build estate, we went to have a nosy to see what they were like. We weren't impressed. They were too close together, small gardens, not enough parking spaces which were too small anyway. Back at the house I had a drink and left to come home. It was a nice afternoon out with my best friend Carol. Steady drive back home, couldn't be bothered to rush. Thanks for popping in, and thanks for all your comments, we'll catch up soon. Day 6. Morecambe to Cleveleys. Day 3. Patterdale to Bowness.